Watch anime online, stream anime episodes online for free.Watch Naruto Shippuden Episode 39 English version online and free episodes. Anime Episode guide, Chapter Naruto Shippuden Episode 39 English dubbedThe Tenchi Bridge Yamato disguises himself as Sasori within Hiruko, and goes to meet “the spy” at the Tenchi Bridge. The spy is revealed to be Kabuto, who spills out the location of Orochimaru’s current hideout. Before the meeting could finish, Orochimaru appears and interrupts the two. 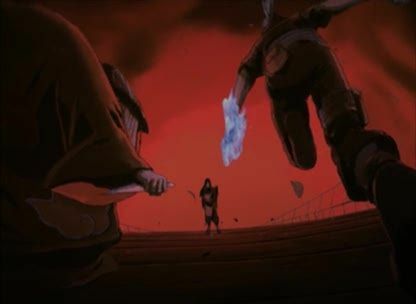 While Kabuto initially seems frightened by Orochimaru’s appearance, he stops the ruse and turns around to attack Yamato disguised as Sasori, revealing his and Orochimaru’s trap. Seeing Yamato’s Wood Style Jutsus, Orochimaru recognises him as one of his test subjects in Konoha years ago, when the latter tried to replicate the Wood Style from First Hokage’s DNA by injecting it in the bodies of numerous unborn babies, out of which only Yamato survived. Orochimaru then tells Yamato to call out Naruto, Sakura and Sai from where they are hiding.